After a couple of weeks in Bali, we planned another 2 weeks in Thailand to explore a new island, where we have never been before. 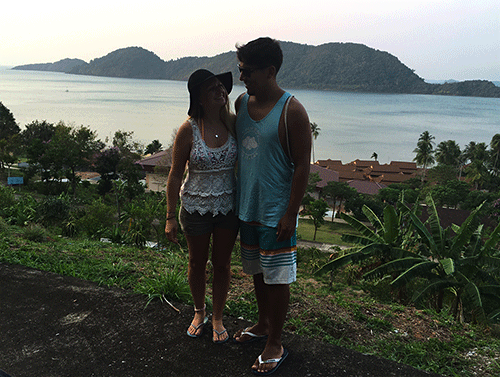 We have been to Thailand 5 times in the last couple of years, but never visited Koh Chang! So we hopped on a bus and a ferry and 10 hours later we are back to island life, where we stayed at the beautiful Aiyapura Koh Chang! Koh Chang is a wonderful island, which is located near the border to Cambodia, about 170 miles from Bangkok. This was our first time visiting Koh Chang and we really like the Island with its tropical rainforests and mountains as well as the white sand beaches. We stayed at The Aiyapura Resort, which is a beautiful place to spend a peaceful and relaxing vacation. It is only a 10 minute drive from the pier, where we arrived with the ferry. 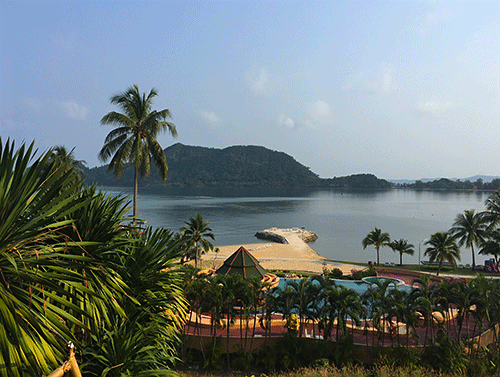 The resort ground is huge and offers a incredible scenic view of the ocean. After arrival we received a delicious welcome drink at the reception, before we were the shown our great sea view bungalow. The staff also took us on a little ride with the golf cart around the whole resort, where he took a photo of us at the view point. We especially enjoyed the big terrace of our sea view bungalow with the amazing ocean view, where Jeremy loved to play his guitar. This is a very exclusive resort with a gated entrance with access to its own private beach and pier. We always felt save and had a really good time! In the tropical garden are so many different animals like peacocks, which create a very special and magical atmosphere. Every morning we woke up with the sound of the tropical animals singing! The Aiyapura Koh Chang has a pool and a private beach as well as its own pier! 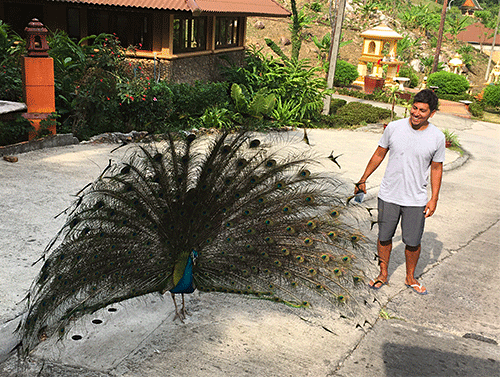 It was a very special time we spent at the Aiyapura Resort and we loved it! They offer so many fun activities like biking, kayaking and the highlight is the jump mania, where you can spend a great time jumping around on the huge indoor trampolines.